The Forum is located at 318-328 East 43rd Street (adjacent to the CTA station) in Chicago’s historic Bronzeville community. Built in 1897, the structure contains one of the most important assembly/performance halls in the city and possibly the oldest hardwood ballroom dance floor in Chicago. This imposing red brick building played a significant role in Chicago’s cultural scene by hosting performances of music luminaries—including Nat King Cole—and by providing space for civic groups and political meetings. After the closure of “Forum Hall”, the second floor performance space, in the 1970s, the building fell into disrepair. In 2011, Urban Juncture Inc. stepped in to rescue The Forum from city-ordered emergency demolition. Over the last few years, Urban Juncture has made important structural repairs to the building and has hosted several events (on the wide sidewalk and street just east of the building) in collaboration with partners including IIT Urban Activators, Revival Arts Collective, Bronzeville Retail Initiative, See Potential, O.U.R. Block Club, Chicago Film Archives, South Side Community Arts Center, and Chicago Architecture Foundation. 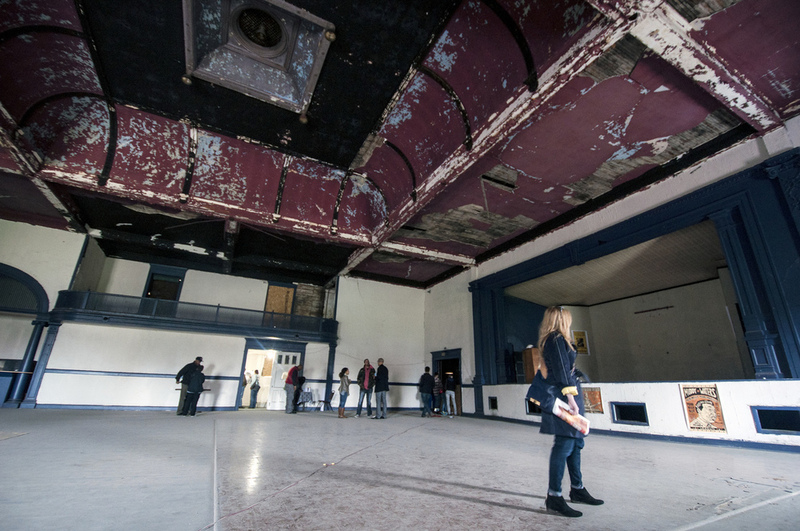 Urban Juncture Inc. has begun the design process for the complete restoration of The Forum, beginning with redevelopment of the first floor spaces into hospitality and performance/gallery venues.